Every year, Lola's Cafe donates a raffle item at the Starry Starry Night Fundraiser that the Walkway Over the Hudson puts together. 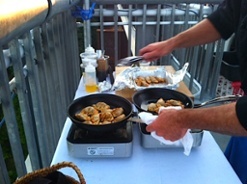 Lola's Cafe donates dinner for 6 on the Walkway Bridge. 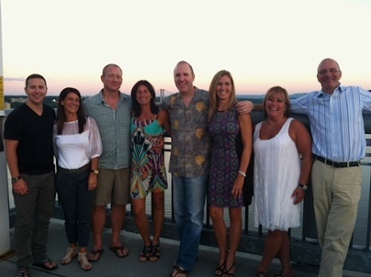 Last night, the winners of the 2012 raffle chose to dine out on the bridge. CIA trained, Chef Ed Kowalski, owner of Crave and Lola's drove out to the first bump (from the Highland side), where he set up a beautiful table overlooking the Hudson River. Around 7:00, the diners were dropped off by the limo and they walked to meet us on the bridge. The diners started off with Prosecco donated by the Walkway Bridge and soon after Chef Kowalski had the first course. For dessert, they enjoyed a raspberry chocolate tart with fresh berries, and house whipped cream. The diners walked off the bridge around 9:30 to be picked up by the limo driver who brought them back to Poughkeepsie.